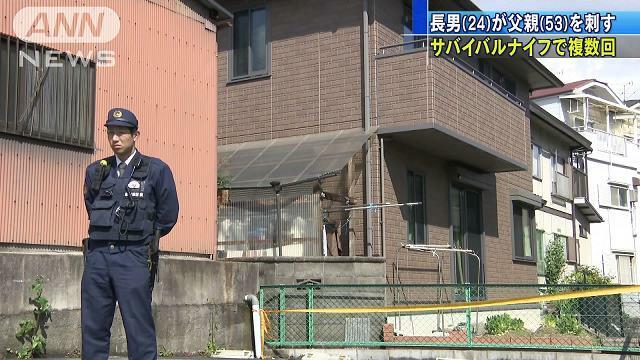 NARA (TR) – Nara Prefectural Police have arrested a 24-year-old man over the fatal stabbing of his father at their residence in Ikoma City on Sunday, reports the Sankei Shimbun (Apr. 15). At around 8:05 p.m., Kodai Shiozaki, a company employee, allegedly used a survival knife with a 20-centimeter-long blade to repeatedly stab his father, 53-year-old Mitsuyoshi, in the back. Mitsuyoshi was transported to a hospital but he was later confirmed dead, according to the Ikoma Police Station. Officers later arrested Shiozkai on suspicion of attempted murder. “I stabbed him while intending to kill,” the suspect was quoted by police in admitting to the allegations. After the incident, the suspect tipped off police. Officers arriving at the residence found Mitsuyoshi collapsed in the living room. Police are now investigating whether to change the charges against Shiozaki to murder.